Colic. The hours and hours of crying that you just can't seem to ease. It's rough. My daughter had colic. I had never experienced it with another baby before. When I was a nanny, their daughter had colic, but she would only cry at night after I had gone home. But my daughter was a different story and I remember the long days of bouncing and rocking and burping. Baby colic is quite common: In fact, 3 out of every 10 babies may suffer from it at some point. Baby colic usually starts in the first 6 weeks of life and may continue for 3 to 4 months (or longer). So I decided to share what worked for us to relieve our baby's discomfort and hopefully you can find some relief too. 1. Motion. My daughter's favorite way was when I was standing up, lightly bouncing her in my arms. I would often pat her hiney just a tad as well. Car rides were also very helpful. 2. White noise machines. My son never experienced colic and I think it was because we had a white noise machine. He still sleeps with it on and we have taken it whenever we have been on vacation. The womb is so loud and they get use to that. So a white noise machine can be very comforting. But you could also try a vacuum, dryer, or fan. 3. Avoid Over Stimulation. My daughter would easily get over whelmed by her surroundings because of colic. She did well in a bath. She also took a pacifier which helped. But what seemed to cause our daughter from getting over stimulated was too much bright lights. 4. Reduce their air intake. They make specifically designed bottles that can help reduce colic. My son was always more gassy after a bottle. Bottles actually aren't one size fit all. You have to find what works for your baby and the shape of their mouth. I received a free sample of Gerber® Good Start® Infant formula or Gerber® Soothe probiotic colic drops from Gerber. My thoughts and opinions are my own. 5. Feeding tips. Colic can be a symptom of digestive discomfort. Research indicates that the type of bacteria in the infant’s intestine may determine whether a child is colicky. Probiotics can help support a balance of good bacteria in the digestive tract of colicky infants. GERBER® Soothe products (Drops and powder formula) contain Lactobacillus reuteri which is a probiotic that is safe for infants and has been clinically proven to reduce crying time in infants. Having a breastfed baby, Gerber® Soothe probiotics Colic Drops with L.reuteri would have been amazing to have for my daughter. I love that it can easily be purchased on Amazon. And Gerber® Good Start® Soothe Infant formula is specially designed to ease excessive crying, colic, fussiness, and gas while providing complete nutrition. So if your baby is formula fed, you can help relieve your baby's digestive discomfort. And it is also available on Amazon. 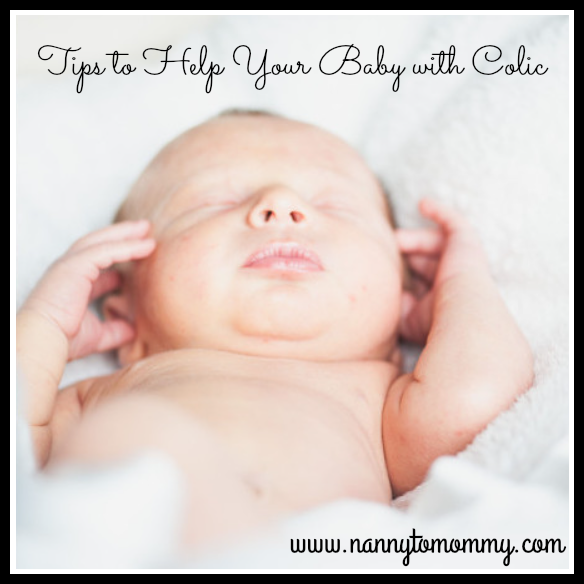 Did you baby experience colic? If so, what tips do you have to relieve their discomfort? 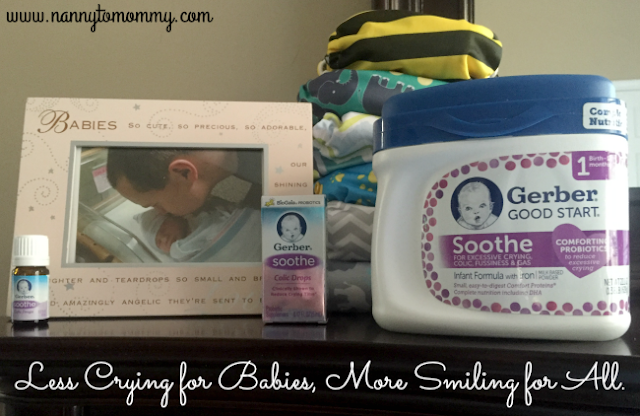 Gerber® Good Start® Soothe is a routine infant formula. Gerber® Soothe probiotics is a supplement probiotic. This product is not intended to treat or cure any disease. Such great tips!! Colic can be so frustrating!! We love gripe water for our son!! This is good to read--I used to keep my colicky niece and it was very stressful! Thanks for sharing your tips. I am sure they will be helpful to someone going through this tough time. My babies all have fussiness and gas. I think colic. White noise and movements helped. Yes stimulation made it worse. If i could get them to sleep they can sleep it off. With my third that helped most. I never thought of probiotic drops though. Love that. Thank you. My baby was very colicky. I wish I would've tried Probiotic drops! My friend used a vacuum cleaner noise. It was on all the time but seemed to work. Car rides as you said was helpful to her baby too. I'm grateful my babies didn't have this. I had one colicky baby and these tips would have been a lifesaver! thanks for sharing! i hope moms get use out of this when they need it! My sister had a colicy baby, The dr tried the baby on so many things finally when the baby got to be a year old he got better. this is unfortunately necessary advice for me!